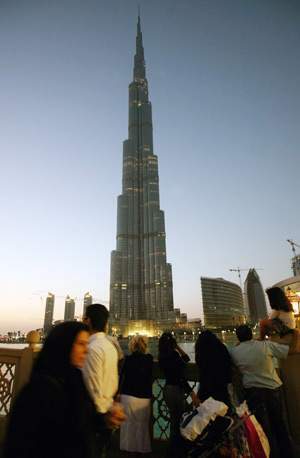 Crowds of tourists visiting the Burj Khalifa have boosted retail sales near the world’s tallest tower by as much as 30 per cent. Since the 828-metre-tall building opened its observation deck to visitors on January 4, the bustling activity has trickled down to the tills in neighbouring Dubai Mall and Souk Al Bahar, retailers say. Maricel Bihasa, a saleswoman at the small furniture and gift shop Tarrab at Dubai Mall, said her sales were up 30 per cent. Nilesh Ved, the chairman of Apparel Group, said sales at its Dubai Mall outlets, including Aldo and Aeropostale, received a sales boost of between 15 and 20 per cent after the Burj Khalifa opened. “Every tourist landing in Dubai right now is going to see the Burj Khalifa, and they’re going to Dubai Mall,” Mr Ved said. The Burj Khalifa, more than 160 storeys tall, opened last month amid fanfare and fireworks after five years of construction. Tourists are a common sight at the base of the tower, with cameras in hand and necks craning back to take a photograph, and they are giving a much-needed boost to surrounding retailers after a tough year. Consumers in the emirate have watched their budgets as new malls, such as Oasis Centre, further stretched the available pool of shoppers. While the traffic at Dubai Mall has grown gradually since it opened in November 2008, the unveiling of the emirate’s newest tourist attraction triggered an added rush, said Mohi-Din bin Hendi, the president of the Bin Hendi retail group that runs Sammach seafood restaurant in Souk Al Bahar. He estimates sales at his Souk Al Bahar and Dubai Mall restaurants and shops grew by between 15 and 20 per cent last month, compared with December. Jane Hunter, the assistant manager of More Cafe in Dubai Mall, said business was constant. But not all stores are reaping the benefits. Shamsher Ali, the manager of Emad Carpets in Souk Al Bahar, said he had seen new faces in the mall, but they were not spending. Laurent-Patrick Gally, a retail analyst at Shuaa Capital in Dubai, said restaurants were likely to benefit most from the extra customers, but long-term gains for other retailers hinged on whether their wares appealed to tourists or tower residents.